An optional free feature is 'time of day routing'. Send calls to different phones at different times of the day, even to different countries at different times. Many free features are included. A Toll Free phone number permits a caller to connect to you at no cost to them. For example, if you get a U.S. toll free number, anyone located inside the U.S. can reach your office in, for example, Madrid Spain, a free call for your customer. For example you could be located in the USA but have an office in Argentina or simply have callers located in Argentina. You can buy an Argentina Toll Free number. The callers located anywhere inside Argentina can then call your Argentina Toll Free number at no cost to them and reach you at any worldwide phone number you choose. The big difference is whether or not you need a number for your callers to be accessible from a small geographical area (local) -or an entire country (toll free). You can Select Your Toll Free Number in Over 140 Countries. Example - you can buy a private toll free number in the USA, France, the UK, Hong Kong, Canada, Australia or any of the available countries. Your dedicated toll free number is accessible to the callers inside your selected country at no cost to the caller. This toll free call forwarding number will be a 'country specific toll free number' for the country you select. It's possible that your new toll free number may be accessible from other countries at a surcharge to the caller imposed by your callers phone company, whoever that may be. We have no way of knowing if/what those charges would be as they are not imposed by us. Most customers acquire a toll free call forwarding number specifically for callers inside a certain country. Your costs would be the per minute rate and fees from your selected toll free country to your 'ring to' number based on these Toll Free rates. A local number enables your callers to access your new phone number at no cost to them 'if' they are calling from the same geographical area as your selected local number or area code. Callers from outside the new local phone number calling area will be able to call your local number from any country, however, long distance surcharges will be charged by their phone company, whoever that may be. For example, you can own a Rome, Italy local phone number. It would be a local call for any caller located in Rome. It would be a long distance call for someone located in another country. They would need to pay long distance charges to their phone company as they would any other international phone call. As an example, a person in the UK could call your Rome, Italy local number and would need to pay their own phone company for that International Call from the UK to Italy. Another example, if you decide to own a Paris, France local number, your callers in the city of Paris could call your new local Paris phone number at no extra long distance cost to them. You would pay the per minute rates from Paris, France to your 'ring to' number based on these rates. For example, you could be located in the USA but have an office in Argentina or simply have callers located in Argentina. You can buy an Argentina Toll Free number. The callers located anywhere inside Argentina can then call your Argentina Toll Free number at no cost to them and reach you in the USA or at any worldwide phone number you choose. 1. You may be a Greek cruise line operator. You want to make it easy for U.S. clientele to reach your reservation desk in Greece. Buy a U.S. Toll Free number, remove the obstacle for your U.S. callers and give them your U.S. toll free number to reach you at no cost to them. 2. You own a winery with headquarters in France and have distributors in the UK, Australia, New Zealand, Germany, Italy and the U.S. You can buy country specific Toll Free numbers for the UK, Australia, New Zealand, Germany, Italy and the U.S. that will redirect all callers in those countries to your France main office phone number. Click here to view rates. Accepting and forwarding multiple calls simultaneously is a free feature. The simultaneous call feature is available for the majority of countries where local numbers are offered. Check the rate schedule. This service is based on public network infrastructure (PSTN). It is not a VoIP service. Calls transported over (VoIP) the Internet are subject to uncontrollable transport, bandwidth and other issues. These call quality issues are especially apparent if the call is being forwarded internationally using VoIP. Consequently the potential for negative call quality issues typically associated with calls over the Internet are virtually non existent with Global Call Forwarding service. 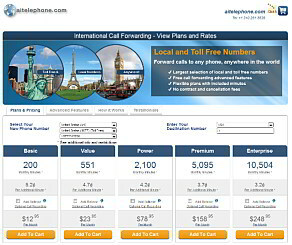 Costs are determined by your choice of call forwarding city. For example, assume you want a Sydney Australia phone number, if your select the standard plan, a Sydney number costs US$ 17.95 per month which includes 150 minutes to redirect calls from your Sydney number to the USA. Please see this link to view the 'latest' rates. Another example, assume you want a virtual phone number in Paris France, the basic plan monthly is $12.95 and includes 200 monthly minutes of call forwarding. Provide your associates, customers or family a local phone number and have all your calls routed to any phone number you desire, located anywhere in the world. If your customers are located in a different country than you, or if you travel often or if you have family or friends overseas, now you can give them a local phone number and easily receive their calls. Use this service for call forwarding to your cell phone or landline. Or, have your cell phone calls forwarded to another country. Once your account is activated, you can login online and modify your call forwarding number, if desired. The change is effective in real-time and takes just seconds to do. As an example you could have your calls forwarded to a number in Japan in the morning and change the call forwarding to a number in the UK in the evening. Or change it from your landline to your mobile phone, at any time. What will callers hear when they dial my Call Forwarding number? Calls are connected very quickly. The caller will hear normal call processing as with any other call they make. What is a 'private' phone number? The phone number assigned to your account is unique and does not require your callers to enter an extension number. It is your dedicated and private phone number for your use and distribution. Yes the voice mail feature is included and voice mail messages can be sent to your email address. It can be an advanced usage strategy for cheap international calls. Some of our customers use this service not only as a call forwarding facility but also as a means to make cheap international calls. For example, if you were a customer located in Paris, France and had your assigned France local number, you could login to your account via the Web and change the 'ring to' number to any number in the world that you wanted to call. After you made the change to your 'ring to' number, you would then dial your assigned local Paris number and your international call would connect at low rates to any number in the world. Changes you make to the 'ring to' number are in effect immediately. After you made your call, simply change the 'ring to' number back to normal. 1. Login to your account online. We send the login link on account activation. 2. Change the existing 'ring to' number to the number you wish to call. 3. Dial your assigned CallMyGlobalNumber to make cheap international calls to the new 'ring to' number. Get a private virtual phone number, either Toll Free or Local. Your calls will be diverted to any phone number worldwide. Gain a telepresence in another country or city by using virtual number call forwarding. Your virtual number will redirect your calls to any landline or mobile phone worldwide. This feature is available free. Your virtual number accepts multiple callers at the same time with no busy signals. Forward multiple calls simultaneously to the same phone number. The service is month-to-month. When signing up for an international virtual number call forwarding services, you will be on a month-to-month plan. No contract, cancel at any time with no penalties. Virtual phone numbers available in 140+ countries. » What will my callers hear ? » What is a 'private' phone number ? » Is voice mail included ?